Metal, sometimes, seems like a strange kind of hydra. When a new kind of subgenre of it appears and becomes known by the public, soon it mutates and shatters, creating new subgenres in itself. It’s weird, but personally Big Daddy here prefers to think that this is an applied aspect of Charles Darwin theory about evolution. Yes, if we come to think of music as an aspect of human way of life and culture. And when we are dealing with Doom/Stoner Metal, it is clear what I say. Some bands try to create something more melodic and elegant, and others prefer something more harsh and in a BLACK SABBATH way (but still with melody). 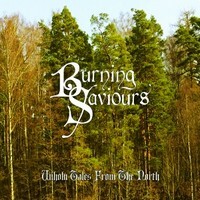 And in this second group of bands, we have the Swedish quartet BURNING SAVIOURS that is releasing now their fifth album, “Unholy Tales from the North”. Their work is similar to bands like PENTAGRAM, C.O.C. (in their Doom Metal times), THE OBSESSED, CATHEDRAL, SAINT VITUS and WITHFINDER GENERAL, that old and bitter feeling of BLACK SABBATH on their Ozzy Osbourne era, but with their own personality. But don’t forget: it has a strong and bold melodic insight. Very good vocals are presented in normal tunes; the riffs presented here are excellent and the solos are melodic and heavy, and the rhythmic basis is very strong and heavy (but with good technique). Their work may not sound like something new and revolutionary in terms of Metal, but is very good. Strangely, they used a good and clean sound quality, and they really achieved a good result with it. Of course the sound is pretty clear to our ears, but it’s still heavy and abrasive as the style requires, so you’ll find all musical details and arrangements without problems. Seven good songs are presented here, and the better ones are “They Will Rise Tonight” (with some good rhythmic changes and very good riff), “Ondskan” and “The Sons of the North”. This is a very good work indeed.